Reverend Father Hezuk Shroff speaks at the Sussex Area Right to Life benefit dinner. May 6, 2018. Honorable Graydon Nicholas, a former Provincial Court judge and a former Leutenant Governor of New Brunswick, speaks at the Moncton Right to Life benefit dinner. Speeches from the 2017 New Brunswick March for Life. Speeches from the 2016 New Brunswick March for Life. 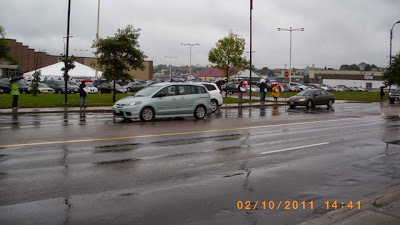 May 19, 2016 - Fredericton. Honorable Graydon Nicholas, a former Provincial Court judge and a former Leutenant Governor of New Brunswick. Shouts of the pro-abortion activists can be heard in the background. New Brunswick Health Minister, Honorable Victor Boudreau. Honorable Jody Carr, PC MLA for Oromocto-Lincoln. Armand and Gladys LeBlanc share their experience of parenting handicapped children. Martha Desmond shares her experience. First speech - by Andre Schutten. Second speech - by Maaike Rosendal. Third speech - by Mike Schouten. Questions and Answers - and plenty of them. The old regulation required two doctors to certify medical necessity. The new regulation does not mention that even one doctor must do so. Is there no requirement for a doctor to establish medical necessity at all? Will abortions be performed purely on demand rather than on the basis of medical necessity? If abortions will be done on demand, why are they not considered electives like other procedures done on the basis of patient wishes (listed in Schedule 2)? And why are taxpayers paying for a procedure that is not medically necessary? The old regulation stipulated a hospital abortion must be done by a specialist. The new regulation does not mention who must perform the abortion. Is there a requirement that the procedure must be performed by a physician – and if so, where in law is that set down? What would prevent the procedure being performed by a non-physician? The health minister says he does not expect a spike in the total number of abortions performed in New Brunswick (about 1,000 / year in the past). But when previously 60% of abortions were paid privately (@ $500-800 each), and now all abortions will be free, is it not to be expected that abortion numbers will rise – toward the higher rates seen in Nova Scotia, Newfoundland and other provinces without the type of restrictions NB has had? The minister estimates that increased abortions expected in hospitals will cost the health care system an additional $500,000-700,000 per year. But is that estimate not based solely on the cost of operating room time ($1,000 / hour for 500-700 additional procedures)? Does it not exclude the additional fees paid to at least three personnel (surgeon, anesthesiologist, pathologist)? Would those fees not increase the additional cost by 50-70% ($1,500-$1,700 / abortion), resulting in total additional costs of $750,000-$1,200,000 per year? And if the total numbers increase beyond the minister’s expectations [Point 5 above], will not the additional costs be even higher? NB Right to Life estimates that the additional costs will easily be in the $1,000,000 to $1,500,000 range, and the total abortion costs for Medicare will be at least in the $2,000,000-$3,000,000 range (new costs plus current costs). Those figures do not include the cost of treating post-abortion complications (2-3% of procedures involve immediate physical complications; longer term physical and psychological complications affect many more women, according to much research). The above questions are surely all legitimate. As New Brunswickers consider the implications of a policy change rightly described as “monumental,” they deserve some answers. At first it looked like there would be 20 people at most, but in the end, we had about 35 people coming, in spite of the pouring rain. 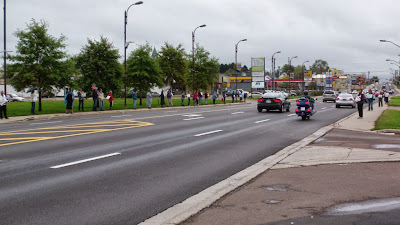 There were also 7-9 pro-aborts protesting on the other side of the street. There were plenty of MLAs present; some say - as many as 23 of them - which is too, a record number. 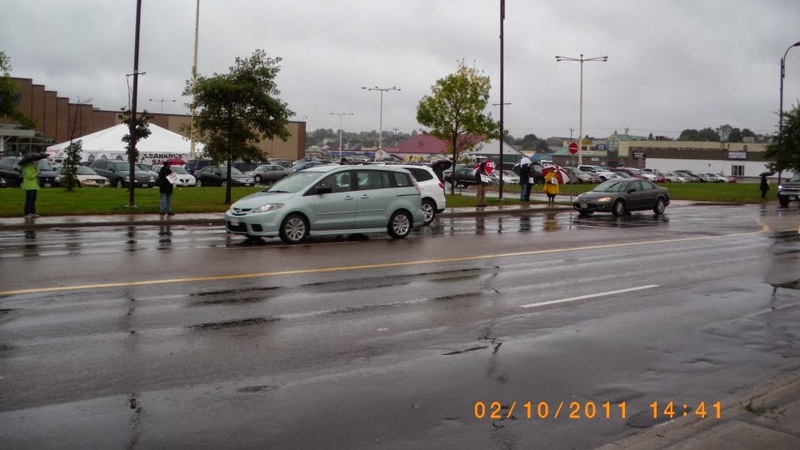 Here are 2 speeches: By Bill Fraser, a Liberal MLA for Miramichi-Bay du Vin and by Jody Carr, a PC MLA for Oromocto. Please excuse the blurry and shaky picture. When the MLAs began to speak, camera men from the mainstream media rushed to the scene, so we had quite a hard time not to bump into one another. There were about 800 of us - a record turnout, almost twice compared to the past years. Marie Claire Muzzerall-Gautreau shares her experience of being a teenage single mother. She is introduced by Beth Crouchman, president of the NB Right to Life. Defending Life from non-religious prospective. Joseph Phillips speaks at the sussex Right to Life benefit dinner. Introduced by his mother, Dr. Elizabeth Phillips. Closing speech by Peter Ryan. The announcement of the Morgentaller "clinic" shutdown that came a couple weeks earlier, reignited the debate over abortion funding in New Brunswick. Didn't have the chance to post these photos back then, but... better late than never. 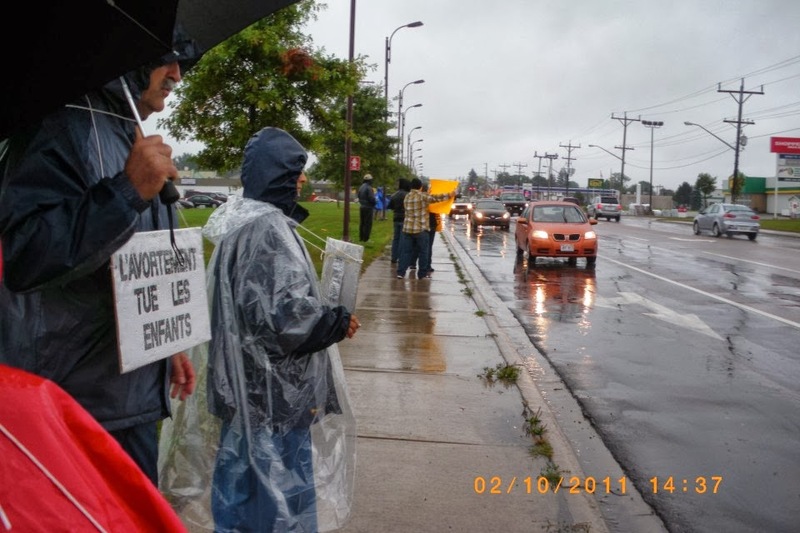 The weather was bad, but we still had around 50 people coming. Pro-abortion protesters tried to get themselves noticed, waving signs at the cars. "Pro-child, pro-choice"? Yeah, right. Because of the Thanksgiving Day, last year's Life Chain took place a week earlier - on the last Sunday of September. The weather was better than in 2011 (although not as great as today) - and we had quite a decent turnout. It may seem like the focus is shifting to the 40 Days for Life, but the Life Chain is still there. About 50 people came to the Life Chain. 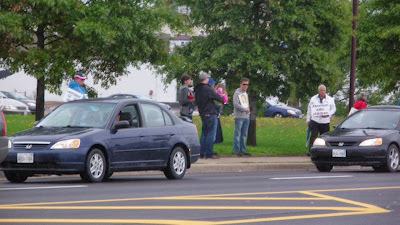 There were about 10 pro-abort protesters on the other side of the street and there was also an unexpected guest - a CBC camera man. Obviously it would be naive to expect an impartial reporting from their team, but the fact that the media started noticing the Life Chain, that alone is inspiring. There was a devoted couple, Jeff and Nancy, handing out the DVDs of the 180 movie to passers-by, to cyclists and even to the drivers. There were many takers; I was delighted to see a young man carefully packing the DVD in his handbag. (I'm certain he was going to watch it.) Cars were driving by - plenty of them. And then we saw this vehicle, quite conveniently stopping in the traffic right in front of me, so I could take a good picture. No, they are not on our team. As I understand, these are private ultrasound providers. And yet for them, who deal with it professionally, there's no doubt that the baby in the womb is alive, that this is a baby, not mere fetus. And that the pro-aborts with their signs that say "pro-woman, pro-child, pro-choice" are lying - first and foremost to themselves. Because murdering a child (whether inside the womb or outside) is never a "choice". ... HELPING 83 workers leave the abortion industry. Now, are you ready to see the proven life-saving results of 40 Days for Life happen in YOUR community? Then you'll want to attend one of two very important webcast events happening next Tuesday, July 16. What you learn on Tuesday, July 16 could change you -- and your community -- forever! WHAT: This event is specifically designed for those interested in holding 40 Days for Life campaigns in NORTH AMERICAN cities. WHAT: This event is specifically designed for those interested in holding 40 Days for Life campaigns in all other INTERNATIONAL cities. ... and you'll learn how, with God's help, you can accomplish similar results where you live. At the end of each webcast on July 16, we'll begin accepting applications for those who want to LEAD a local 40 Days for Life campaign -- from September 25 through November 3. But the ONLY way you can apply on July 16 is to join us for one of these special events. The webcast is absolutely free, but with more than half a million 40 Days for Life volunteers around the world, spaces will fill quickly. A few pictures from the recent New Brunswick March for Life. This year's March for Life started with a Mass. The rally at the Legislature - with about 450 people present. 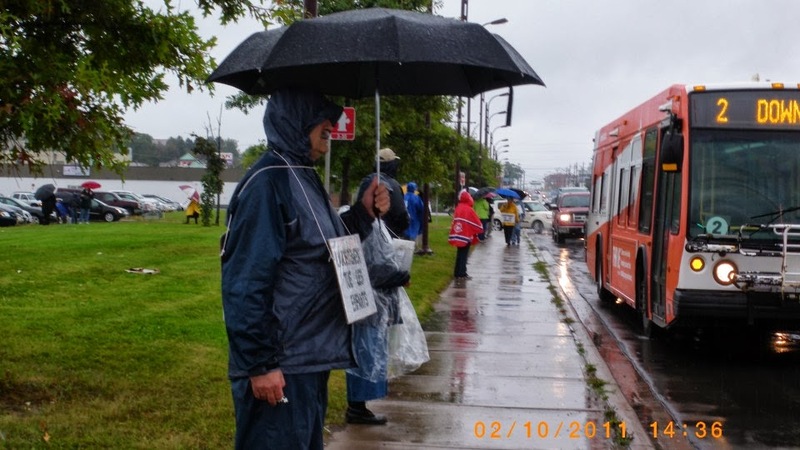 "The crowd was bigger, more youthful and more upbeat than ever"
The theme of the 2012 NB March for Life was, "Pro-Woman, Pro-Child, Pro-Life"
16 of the 55 Members of the Legislative Assembly attended the rally, including nine of the governing Conservatives and 7 Liberals. Roses - to commemorate about 1000 New Brunswick babies that die in abortions every year. Prayer circle at the Mother and Child Welcome House - just across the fence from the abortion facility. Check out Life Site News for a detailed report. How do we overcome these societal evils? PO Box 113, Stn A.